While science communication has become a well-recognised part of scientific praxis in many other disciplines, philosophy communication remains some way behind. However, as Patrick Stokes explains, this is noticeably changing. Firstly, philosophers more often translate their academic research for the public, acting as a conduit between the scholarly literature and the wider community. But there is also a second, more novel approach which is not simply telling the public about philosophy, but doing philosophy in public and with the public. In this process, new knowledge emerges, with both audience and communicator learning something new. It’s surprisingly awkward, when someone asks you what you do for a living, to reply: “I’m a philosopher”. If I had a job that ended in “-ologist” or even just “-ist”, the exchange might be somewhat less uncomfortable. But telling people at a party or other parents in the school playground that you’re a philosopher sounds a bit pompous and, frankly, weird. Better to just mutter something about being an academic and let them pry the rest out of you bit by bit. A large part of the problem here is that, unlike many other disciplines, most people have only the vaguest sense of what philosophers do, or what we study, or how. There are no doubt several reasons for that, but part of it is perhaps because philosophers have been much less active than, say, scientists in engaging with the public. Science communication has become a well-recognised part of scientific praxis; philosophy communication, by contrast, is at least a couple of decades behind. Philosophy communicators are at a disadvantage here relative to our colleagues in the sciences, in that philosophical progress (if it even exists, which isn’t universally agreed) looks very different to scientific progress. Philosophers don’t get to put out press releases announcing radical new treatments for horrific diseases, or beam back gorgeous photos from space probes. Nor, in almost all cases, do we have anything like a consensus or even a mainstream view to report on. Even so, the situation is visibly starting to turn around. The number of philosophy communicators is rising, new outlets for such work are appearing, and professional bodies are increasingly encouraging philosophers to get out beyond the university. But there’s a fair way to go. 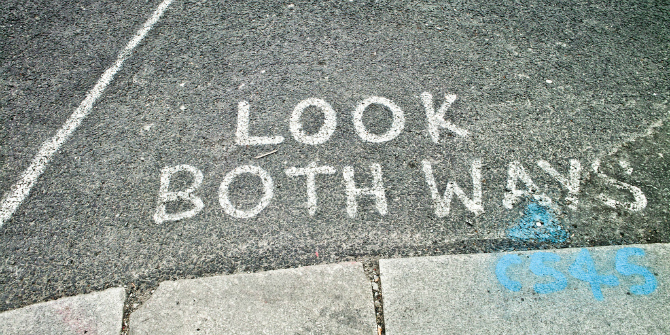 Image credit: LOOK BOTH WAYS by William Murphy. This work is licensed under a CC BY-SA 2.0 license. As I note in a recent paper in JCOM: Journal of Science Communication, philosophers have only just started to articulate what philosophy communication is as a practice, but have already identified two very different aims of such activity. The first is, roughly, translating the academic literature for the public. Most disciplines do this, at least some of the time. It’s a mode of research dissemination, or perhaps even just a form of teaching on a larger, less organised scale. This is especially the case when the goal is the promotion of some form of subject literacy, however this might be defined or measured. Such translation is an asymmetric process. The science communicator – or public historian, sociologist, anthropologist, philosopher, and so on – simply acts as a one-way conduit between the scholarly literature and the wider community. No new knowledge emerges from this process. The public merely learns what a particular community of experts already knew. However, there is a second form of scholarly communication that is available to philosophers, perhaps uniquely so. This second approach is not simply telling the public about philosophy, but doing philosophy in public and with the public. Some of the best public philosophy work has been of this variety, using philosophical tools and approaches to unpack and illuminate contemporary problems, from the existence of jerks to climate change to the rise of the “post-truth” era. In this process, new knowledge does emerge, and both the audience and the communicator (or, to use a term that’s arguably more useful here, the “public intellectual”) learn something new. This is not merely knowledge dissemination; it’s a form of doing philosophy, even if what emerges then needs academic elaboration and defence. The public, for their part, needn’t be merely passive listeners in this process; nor, given the chance to tell authors exactly what they think in real time, will they accept being so. For all the not-so-occasional brutality of online discourse, that reciprocity is a very good thing. Philosophy is fundamentally dialogic in character, and while “never read the comments” is often good advice, below-the-line engagement can be a very effective way of testing, elaborating, and modifying new ideas. We learn from our publics, rather than simply teaching them. This way of doing scholarly communication invites us to rethink some of our default views about the relationship between research and public engagement. In particular, it punctures the assumption that information only flows in one direction between scholarly and popular work. In my own practice I’ve found the path between “traditional” academic research and public philosophy has been very much a two-way street, or even a series of feedback loops between writing for the profession and engaging with the public. For instance, I’ve written previously about the value of expert vs non-expert opinion in debates over vaccination safety. That’s an exercise in doing philosophy with the public, on a pressing issue of the day, rather than simply reporting on what’s in the literature or fostering “philosophical literacy” (which I do also think is an important task in its own right). But that experience, and the sometimes fractious online discussions that flowed from it, led me to explore academic literatures, such as that on the epistemology of conspiracy theory, which I hadn’t been involved with previously. That led me to developing other claims in other such pieces, which in turn has now fed back in to my academic writing. The research-dissemination-impact pathway might not always be linear. Realising this will have implications for the way we measure, and incentivise, scholarly public communication. Rather than seeing writing for or speaking to the public as a post-research activity, an optional extra we can indulge in once the core work of publishing papers in journals is taken care of, we should treat some of this work as part of the research process itself – and not the final part either. I doubt any of that will make “I’m a philosopher” trip off the tongue any more easily. But you never know. This blog post is based on the author’s article, “Science communication and the public intellectual: a view from philosophy”, published in JCOM: Journal of Science Communication. The LSE has its own public philosophy blog – The Forum. Patrick Stokes is senior lecturer in philosophy at Deakin University, Melbourne, Australia. He works on issues of selfhood, subjectivity, death, and time. His most recent book, The Naked Self, was published by Oxford University Press in 2015. His ORCID iD is: 0000-0001-9574-6064. “We need to look both ways” at once, and this means stepping back so as to see the whole of the Big Picture. I refer to our Macro-Economics Social Structure or MESS. My recent book covers this theoretical subject in more exacting engineering details, compared with is older pesudo-science which has little logic. Write to me for a free e-copy and learn how to better understand how our social system works.